I was recently going through some of my late mother’s photographs and came across a photo of St. Peter’s with a tram in the foreground. I guess if I had stood where the old photo was taken I would have been run over these days. Nice photo! This location just south of St Peter’s is actually called St George’s Place. Interestingly the tram appears to be travelling towards Old Steine via the west side of Victoria Gardens – the Gloucester Place side. A picture of the same location in “Brighton’s Tramways” by Robert J Harley (Middleton Press) – plate 67 – shows the same thing. That picture is dated 1906. Presumably these pictures pre-date the eventual one-way circuit of Victoria Gardens: southbound via Grand Parade, northbound via Gloucester Place. 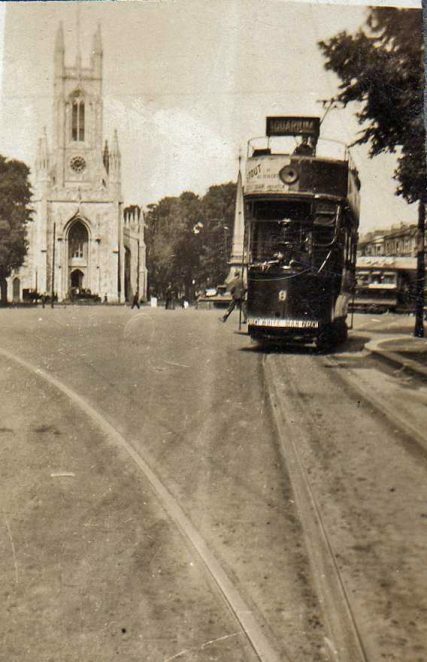 I’m too young to remember the trams, but I do remember the complicated junctions of wiring at the same location where the trolleybuses to and from London Road, Ditchling Road and Lewes Road all met at St George’s Place, coming out of or entering the one way system around Victoria Gardens. 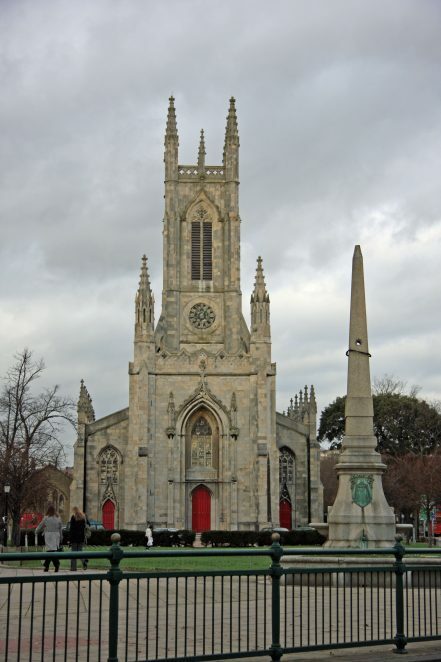 I lived close to St Peter’s Church from the mid 1950s to the mid 1970s and am convinced that I can remember the change from two way traffic round Victoria Gardens to one way – probably late 50s / very early 60s.